The ABCD Diaries: Womb to Walking Giveaway! Prize Package Worth $700+!! 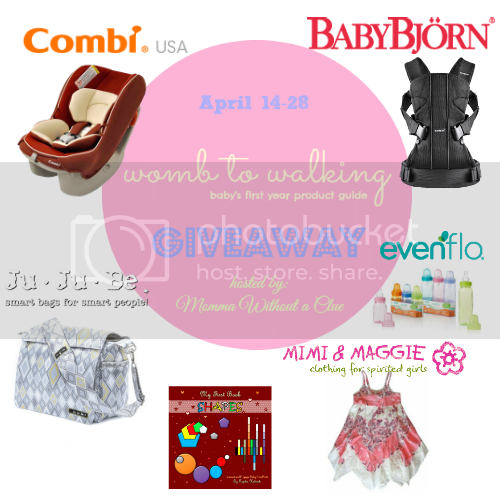 Womb to Walking Giveaway! Prize Package Worth $700+!! ABCD Diaries is excited to bring you this fantastic giveaway hosted by Momma Without A Clue! Spring is in the air, everything is blooming... It's definitely baby shower season! What better way to bring in Spring than with a giveaway?? We've brought together some of the top baby products that you would need from womb to walking - the best for baby's first year - into a great product guide and now we're giving those items away! For a grand total of over $700 worth of baby gear! To enter, simply fill out the Rafflecopter form below. All entries are optional, but the more you complete, the better your chance of winning! Disclosure: Momma Without a Clue received the above items in exchange for review. This blog did not receive financial compensation or product in exchange for this giveaway. Facebook, Twitter, & Pinterest are in no way associated with this giveaway. Prize fulfillment and shipping will be handled by the Sponsors. I am most excited about winning the Ju-Ju-Be Diaper Bag because I don't have one and with a toddler and infant I really could use one! The Combi Carseat will definitely provide added comfort and protection. I am most excited for the combi car seat!